Murdick's - 5 generations of excellence! FREE SHIPPING! Make sure you get the BEST this season– the creamy smooth fudge that is made by the actual MURDICK FAMILY. John and Aaron Murdick are the 4th and 5th generation of the Murdick family to make fudge in the Mackinac Straits area! We are flattered that other stores try to imitate what we do and how we do it, however, we feel that no one has mastered the art of fudge making the way that we do it! This season get Murdick’s Famous Fudge! As you might already know, just having a recipe is not going to help you to make fudge that is rich and creamy! It takes a special knack (we call it, The Murdick Know-How) to produce the quality fudge of your childhood memories! 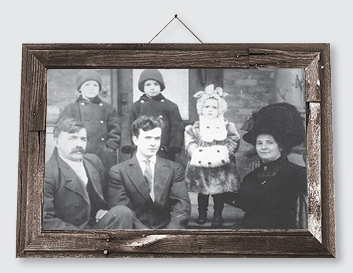 Our family has been making fudge for over a century! We are experts at making fudge! This season we are offering many different Christmas Packages that will bring the world of fresh, yummy sweetness right to your door! We are also making it extremely easy and affordable by offering everyone FREE SHIPPING on every order! We send all of our delicious products via 2 day Priority Mail – you choose your own ship date. You can place your Christmas order any time between now and Christmas and we will ship it on any day you choose! You might even want to place an order for your dessert table at Thanksgiving, or to make your Halloween party a little more unique. Maybe you are just looking for a unique Made in Michigan gift! Fudge makes the perfect gift to say thank you, or to celebrate any other special occasion! Check out our gift boxing selections! 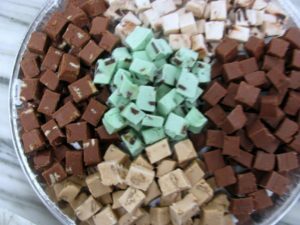 We offer special Christmas packaging for the holidays, or you may just want to order fudge so you can put together your own attractive platters! Read our “Pairing of Fudge and Wines” article for more gift ideas! Who wouldn’t want to nibble on a piece of creamy, chocolate with a bottle of their favorite wine? This Christmas, we are also offering a special FAMILY Fudge Package that will no doubt be one of your favorites. This package will be beautifully put together with 4 half pound slices of your choice of fudge, a half pound of our gourmet, hand-pulled Murdick’s Salt-Water Taffy, a half pound of our buttery Murdick’s Peanut Brittle, and a Michigan Ornament, exclusively made for us by the folks at MICHIGAN IN METAL (out of Gaylord, Michigan). With this package you have a choice between the more natural bare metal Michigan ornament, or the white Michigan ornament with silver glitter. Your Murdick’s Fudge Family Christmas Package will be festively tied with Navy raffia and a beautiful Christmas Card will be included with a brief history of Murdick’s Famous Fudge and your special message! We will make your shopping easier this year by offering the perfect gift wrapped fudge package for the hard-to-shop for person on your list! Wrapped in festive paper and sent conveniently right to their door – this freshly made fudge, boxed separately, each slice sealed with a gold “A Gift For You” sticker, will fit the bill for those family and friends! Choose from a 2 slice package or a 3 slice package of half pound boxed and labeled creamy, rich fudge, complete with a beautiful Christmas card and special message! Murdick’s Christmas package of 3 slices of fudge! For those special friends this year, you may want to send our 3 slice Christmas Fudge Package plus the exclusive Michigan ornament! This gift is festively wrapped in a vintage mailer, shipped right to your special friend, relative or significant other. Murdick’s Christmas Package – 3 slices of fudge with Christmas ornament. Other combinations of fudge, taffy and brittle selections are also offered on our shopping page. Be sure to check them out and bookmark our page for Christmas ordering. Whatever your holiday needs may be – make your holidays sweeter with us — Make it Michigan – Make it Murdicks!